CES Challenge Blog so something to smile about. Thankyou to all who entered my challenge last week, gorgeous cards and I enjoyed looking at them even if I didn't have time to comment on all. This weeks theme has been set by team Sheena and she has chosen "Anything but Square" (a shaped card). Didn't read this bit and not sure if rectangle is classed as a shape but too late now LOL. Now I must admit to not having alot of free time these last few days so I have used a Wild Card from October Afternoon but decide it looked a little bland so coloured with Copics/Promarkers and a Clear Gloss Glaze. The papers are WOJ available from Crafty Emma's Store along with the Miniature Carnations, Button and Fibre and Cherry Blossom Flowers. The border punch is EK Success and have also used Stickles, Paper Doily, adirondaak Gold Paint Dabber and Viva Pearl Pens. Distressed paper with MME Distreser and Chalk Ink Pad. The gardeners have finished my new Deck area so I went out yesterday and added a bit of colour. I will add a piccie as soon as the suns shines. So wonderful card Claire,I love the image and the colours. This card is gorgeous. Beautiful colours and a fabulous image panel. I love it. Great card hun love the colours & the image is fab! Beautiful vintage look card. Your distressing is perfect. Hope you get some sun this weekend, to try out your new Deck. Beautiful card Claire,lovely image and colours. Wonderful creation, Claire! So original and special! Thanks for sharing sweetie! So beautiful and pretty Claire. 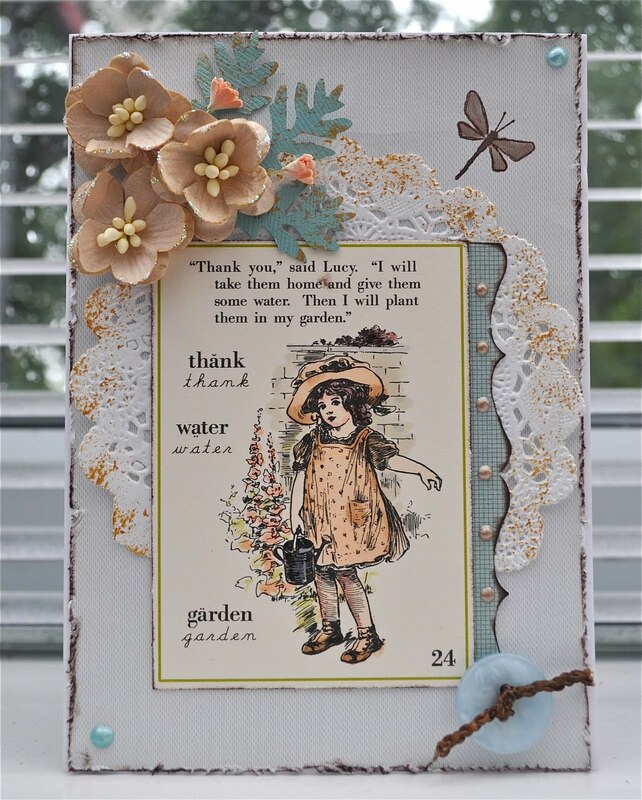 What a beautiful vintage card Claire, so lovely! Hi Claire, Beautiful card! Such a sweet image. Hi Claire, Fabulous card hun and such a lovely vintage image. Love it. OH...Claire, your card is fabulous!!! The look is great and the stamp are wonderful. Hi Claire :) Hope you are keeping well hun. This is me just trying to get back into the swing of things, so thanks so much for your lovely message. Its been great visiting your blog today and catching up! Really gorgeous card Claire! I love that image, beautiful. this is just so pretty! I love the whole style of it! wow, this is really gorgeous !! I love vintage card!! Super card Claire. Really quirky - love the vintage look. Oh, this is so beautiful, Claire! The image is adorable and I love the vintage feel. This is so beautiful Claire. Thank you for joining us at CYDA this time. such a marvellous and stunning card! Gorgeous card Claire! So much eye candy to look at!! What happened To My garden?? ?